I’ve definitely been bit by the travel bug…in more than one way. Getting sick while traveling is a challenge but understanding the right measures will get you feeling good as new and ready for your next adventure! As I headed off on my first backpacking journey during my 3 weeks off in April, I felt the first signs of a cold. I ignored my stuffed up nose and headed off on my adventure! Well, my cold followed me all around Europe and 10 countries. After my 5th stop Berlin and with 10 days left of my trip – I could no longer ignore my stuffed up nose that had turned into what felt like the plague. By trial and error I soon discovered I had walking Pneumonia – emphasis on the WALKING, as we were covering about 16-20 miles every day with sight seeing and traveling. As I was only in each country for 2-3 days I had to do with holistic and over the counter remedies. 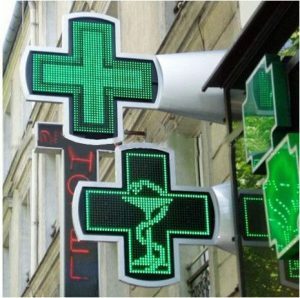 The neon green cross is common symbol for pharmacy and are found in abidance in all major cities! In countries with language barriers, I utilized google translate to fully detail my symptoms and the employees were able to give me accurate over the counter medicine. As I was only in each country for 2-3 days, I had to do with holistic and over the counter remedies to get me through the rest of my trip until I returned to Belfast. On my return to Belfast, I headed down to the student health center. I filled out some paperwork to enroll in the National Health Service. Although, the healthcare is free and I received amazing care – I waited two days to get an appointment which in the middle of finals and facing a month long illness can be exhausting. After a round of antibiotics and some rest – I was ready for my next adventure! Getting sick while abroad can be stressful but taking a moment to rest and get the care you need will get you back on track.